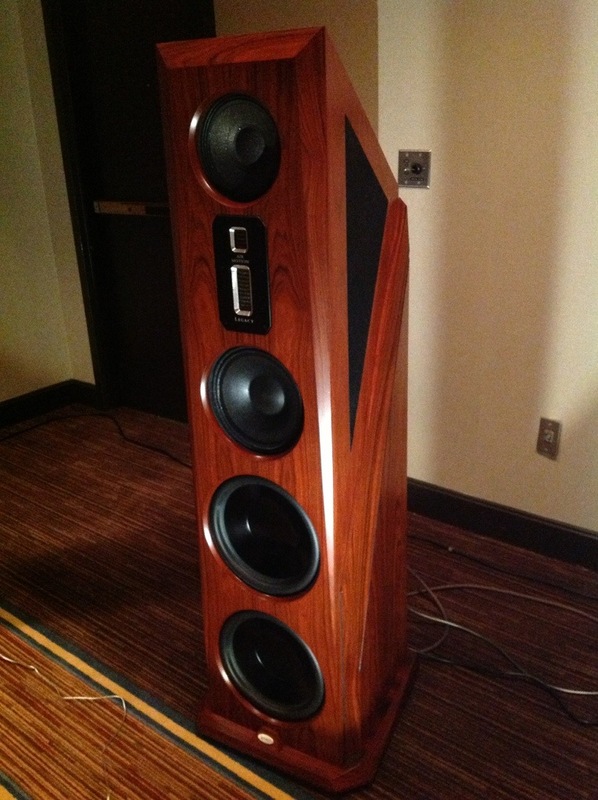 Bill Dudleston of Legacy Audio was showing the new Aeris ($17,750) loudspeakers on one end, and on the opposite, the Whisper XD ($21,500) and Signature SE ($6,450). 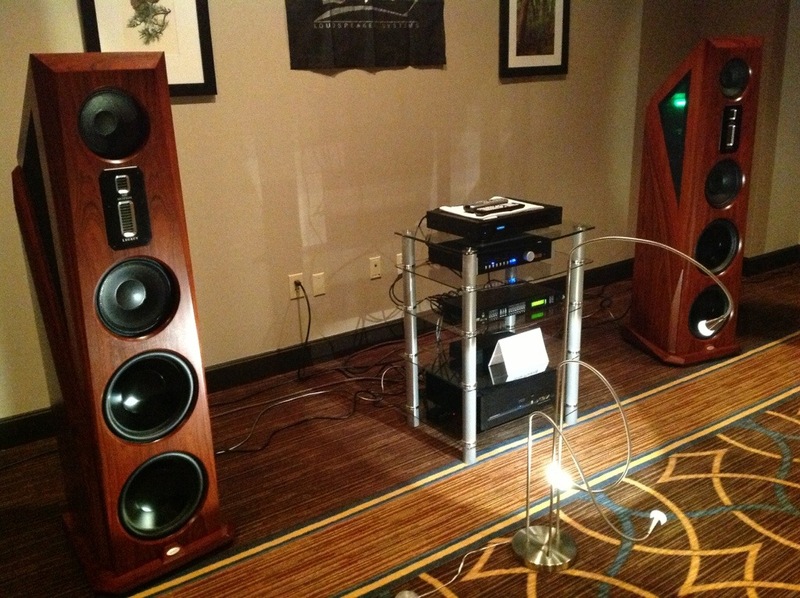 All of these speakers sport the new AMT tweeter array I got to see, first, at last year's Capital Audiofest. What does that do, for Bill's speakers? Life! Light! Speed! Air! Not that these things weren't present in the outgoing model, but there's a notable delicacy to the sound that is rather compelling. Bass is always a challenge, especially given the quality of the room boundaries here (diffuse, to say the least), but the DSP control of the bass was more than helpful, and the overall presentation was simply captivating. 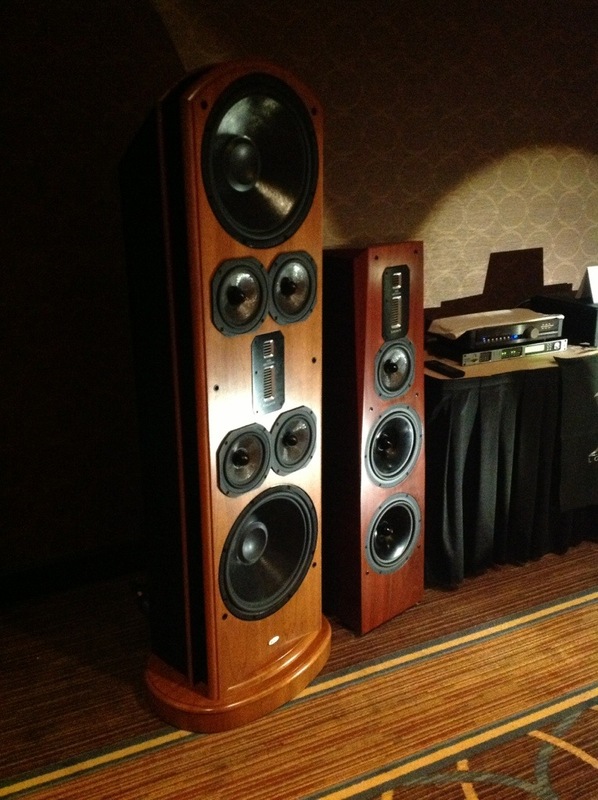 Great big sound, which makes a sort of sense as these are all great big speakers. Fantastic showing. The Signature SE is a sleeper, folks. Check that “little” guy out. 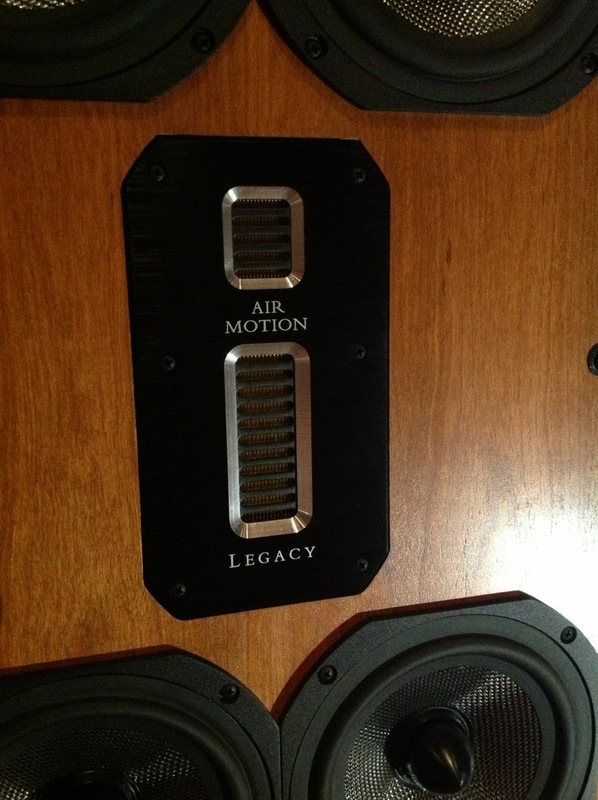 A ton of Legacy sound, and you can save a boat load of cash. Personally, I think the Aeris has some truly striking lines, and the various finishes I’ve seen on the line tell me it’s hard to go wrong here — just think about what’s going to fit your scheme and trust the team. That sneaky green glow coming out of the top of the cabinet is eerie. Me likey. On the Whisper side, I found a CODA CSX Amplifier ($6,000), a CODA CP Pre-Amplifier ($3,500), and an Ayon CD 2S player ($6,350). Th Ayon was swapped for an OPPO BDP-105 ($1,199) to fill in on the Aeris side. The other bits in the rack were the crossover/DSPs. The Signature SE was *very* impressive. Bass was tight and tuneful. Midrange and treble were free from coloration. The electronics and the speakers didn’t seem to strain to deliver large dynamic peaks even with the volume turned up in the large room. 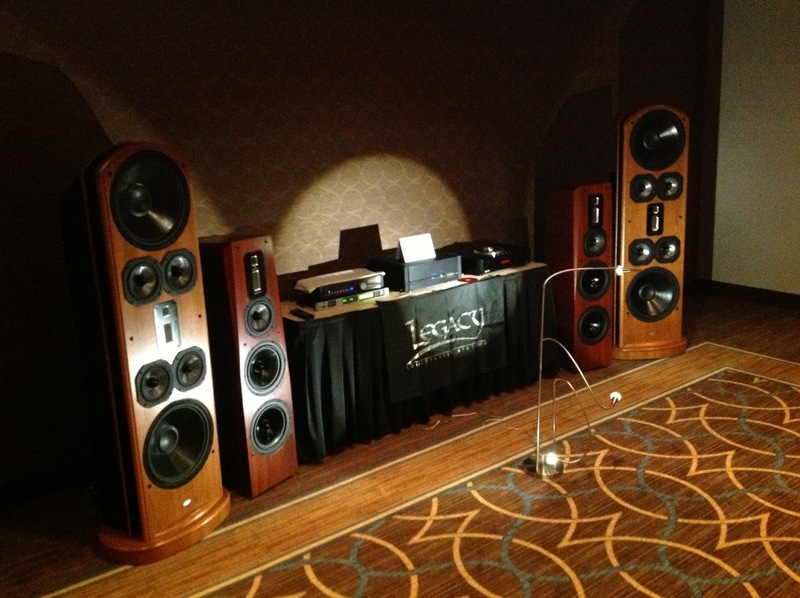 Definitely one of the best sounding setups at the show. 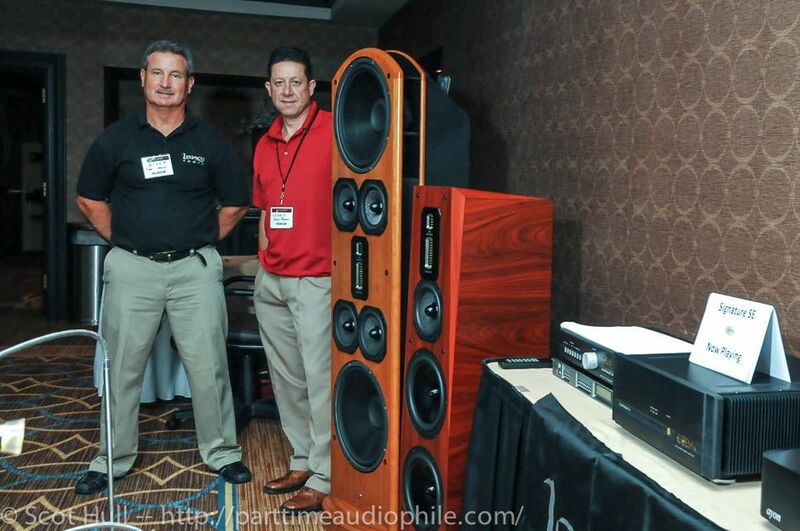 Best Speakers ive ever heard hands down. The Aeris look esthetically pleasing to the eye. Very distinctive, in an audio world full of oblong boxes. Wishing you and Doug great success with them! These are a speaker that once you have owned, you judge everything else against. How do you think I know? That’s the Signature next to the Whisper, not a Focus.